Activation-induced deaminase (AID) initiates U:G mismatches, causing point mutations or DNA double-stranded breaks at Ig loci. How AID-initiated lesions are prevented from inducing genome-wide damage remains elusive. A differential DNA repair mechanism might protect certain non–Ig loci such as c-myc from AID attack. However, determinants regulating such protective mechanisms are largely unknown. To test whether target DNA sequences modulate protective mechanisms via altering the processing manner of AID-initiated lesions, we established a knock-in model by inserting an Sγ2b region, a bona fide AID target, into the first intron of c-myc. Unexpectedly, we found that the inserted S region did not mutate or enhance c-myc genomic instability, due to error-free repair of AID-initiated lesions, in Ag-stimulated germinal center B cells. In contrast, in vitro cytokine-activated B cells display a much higher level of c-myc genomic instability in an AID- and S region–dependent manner. Furthermore, we observe a comparable frequency of AID deamination events between the c-myc intronic sequence and inserted S region in different B cell populations, demonstrating a similar frequency of AID targeting. Thus, our study reveals a clear difference between germinal center and cytokine-activated B cells in their ability to develop genomic instability, attributable to a differential processing of AID-initiated lesions in distinct B cell populations. We propose that locus-specific regulatory mechanisms (e.g., transcription) appear to not only override the effects of S region sequence on AID targeting frequency but also influence the repair manner of AID-initiated lesions. Activation-induced deaminase (AID) catalyzes two B cell–specific DNA alteration events, somatic hypermutation (SHM) and class switch recombination (CSR) (1). During SHM, point mutations are introduced into V region exons and the immediate downstream intronic J region, thereby enhancing the DNA sequence diversity of V regions to allow the selection of B cell clones with increased affinity for Ags (2). To diversify Ab effector functions, a specific DNA recombination process termed Igh CSR occurs within the C region of the Igh gene (3, 4). CSR targets highly repetitive and specific sequences termed switch (S) regions, which are located 5′ of each set of CH exons except Cδ (5). AID introduces DNA double-stranded breaks (DSBs), the essential intermediate of CSR, to the upstream donor Sμ and a downstream acceptor S region (3, 4). The rejoining of the broken S regions is catalyzed via nonhomologous end-joining (6–9), which results in the switching of the C regions. In response to Ags, activated B cells form specialized lymphoid structures termed germinal centers (GCs) in which both SHM and CSR ensue (10). In GC B cells, robust SHM targets the assembled Igh and Igl V region exons and Igh S regions (11, 12). CSR can be induced by T cell–dependent and independent Ags in vivo, and thus can occur in both GC and extrafollicular B cells (13). Additionally, CSR can be induced in vitro by stimulating B cells with different activators, such as anti-CD40 or bacterial LPS in the presence of IL-4 (3, 4), that enable the accessibility of a given S region for recombination (3, 14). Because B cells activated with different stimuli undergo distinct differentiation pathways and display unique signatures of gene expression (15), we hypothesize that the process to generate AID-mediated DSBs may be differentially regulated in distinct B cell populations. AID-initiated DSBs occur in donor Sμ and acceptor S regions that activate the ataxia telangiectasia mutated (ATM)–dependent DNA damage response (16, 17). ATM rapidly phosphorylates numerous substrates, including histone H2AX, 53BP1, MDC1, and NBS1, that form large foci along flanking megabase chromatin regions (16, 17). The DSB response is required for normal CSR, as deficiency in the DNA damage response factors causes a reduction in CSR (6, 16–20). Furthermore, AID-dependent S region DSBs separate and progress into chromosomal breaks and translocations in the absence of a normal DSB response (6, 16–20). Notably, all the analyses of DSB formation were performed in the cytokine-activated B cells in vitro. It has not been previously addressed whether in vivo Ag-stimulated GC B cells differ in their ability to acquire genomic instability. AID functions via DNA deamination of cytosine, which is converted to uracil (21), thereby resulting in a U:G mismatch. AID-initiated U:G mismatches are subsequently recognized by mismatch repair (MMR) and base excision repair pathways that eventually lead to SHM and CSR (22, 23). Based on mutation analysis of MSH2−/− or MSH6−/− mice, MutS protein homolog (MSH) 2/MSH6 (mutS homolog 2/6) heterodimers are responsible for recognizing the U:G mismatches during MMR (23–26). Additionally, the uracil residues can be removed by uracil-DNA glycosylase (UNG) during base excision repair (2, 27, 28). Therefore, the generation of mutations or DSBs requires both AID deamination and recognition of the AID-initiated lesions by MMR and UNG. In the absence of MSH2 and UNG, AID-initiated deamination events are converted to either C→T or G→A mutations by replication machinery in the JH4 intronic region or S regions in GC B cells (27, 29); thus, this mutational signature represents the footprint of AID deaminase activity. A central unresolved question in the AID field is how AID-mediated DNA alterations are specifically targeted to Ig loci, yet refrain from causing genome-wide damage given the potential of AID to access the genome widely to induce genomic instability at non–Ig loci (30). Previous studies proposed that a differential DNA repair mechanism protects non–Ig loci from AID-mediated mutations (31). However, it remains largely unknown how such a protective repair mechanism is regulated at non–Ig loci. c-myc is a frequent translocation partner of Ig loci in human mature B cell lymphomas (32); in fact, the Igh–c-myc translocation was the first molecularly characterized translocation (33, 34). These translocations are thought to derive from GC B cells (35). However, extensive sequencing studies of the c-myc locus in human memory B cells showed little SHM activity (36–38), suggesting that c-myc is not an efficient AID target under physiological conditions. Later studies showed that the endogenous wild-type (wt) c-myc locus was protected from AID-mediated alterations in GC B cells (31). We recently demonstrated that the mutagenic activity of AID depends on its target sequence at a non–Ig locus, Bcl6 (39). Thus, we sought to test whether target DNA sequences could disrupt the protective mechanism by modifying the processing manner of AID-initiated lesions at the c-myc locus. To accomplish this goal, we established a knock-in (KI) model by inserting a bona fide AID substrate, an Sγ2b sequence, into the first intron of the mouse c-myc gene via homologous recombination (c-mycSγ2b). In the context of the Igh locus, the S region is critical for CSR and a substrate for AID-induced mutations. Thus, by inserting the Sγ2b region into the c-myc locus, we can also investigate the influence of genomic context versus primary DNA sequences on AID targeting. Unexpectedly, our findings reveal that the inserted S region only enhances the c-myc genomic instability in the in vitro cytokine-activated B cells but not in GC B cells. Furthermore, we found that the presence or absence of an S region sequence does not alter the frequency of AID-mediated deamination in either GC or in vitro–activated B cells at the c-myc locus. Thus, our studies, to our knowledge for the first time, uncover a striking difference between GC and in vitro cytokine-activated B cells in generating genomic instability, and they demonstrate that AID-initiated lesions that occur at a similar frequency can be differentially processed in distinct populations of B cells. More importantly, our unique experimental systems provide insights into the differential influence of genomic context versus primary DNA sequences on AID-mediated mutagenesis. An ∼4.6-kb BamHI fragment from the Sγ2b genomic sequence (accession no. AJ851868) was targeted into the unique DraIII site between exons 1 and 2 of the c-myc locus. A 1.1-kb BamHI-BamHI 5′ homology arm from a plasmid containing c-myc genomic DNA was cloned into a SalI site of the pLNtk targeting vector. A 3.3-kb BamHI-XhoI 3′ homology arm containing c-myc genomic DNA was cloned into the XhoI site of the pLNtk targeting vector. An Iγ2b-Sγ2b fragment (40) was cloned into the DraIII site in the 3′ homology arm. The targeting construct was transfected into TC1 embryonic stem (ES) cells. Correctly targeted clones were detected by Southern blot (EcoRI digest) with two probes that hybridized upstream of the 5′ homology arm or downstream of the 3′ homology arm. The 5′ c-myc probe A was a 1.5-kb XbaI-XbaI fragment upstream of exon 1 and 3′ probe B was a 1.5-kb XhoI-KpnI fragment downstream of exon 3. c-myc probe D was an XhoI-BamHI fragment in the first intron of c-myc. For deletion of the neor cassette through two flanking loxP sites, targeted ES cell clones were infected with recombinant adenovirus that expressed Cre recombinase. The targeted c-mycSγ2b ES cells were injected into blastocysts to obtain germline transmission in 129 mice. Mice heterozygous for the c-mycSγ2b allele were interbred to generate mice homozygous for the targeted c-mycSγ2b allele. The KI allele was detected by PCR using the following primers: forward primer C (in c-myc intron), 5′-GAAGACTGCGGTGAGTCGTGATCT-3′; reverse primer D (in the inserted S region), 5′- GAAAGTGCCCTGGACCCCTGTTAACCACAC-3′. Animal work was approved by the Institutional Animal Care and Use Committee of the University of Colorado Anschutz Medical Campus (Aurora, CO), National Jewish Health (Denver, CO), and the Children’s Hospital in Boston (Boston, MA). For SHM studies, spleen and mesenteric lymph nodes were dissected from immunized mice (see below) and single-cell suspensions were obtained. Cells were stained with peanut agglutinin (PNA)–FITC (Vector Laboratories) and B220-PE and sorted for B220+ and PNAhigh surface expression with FACSVantage (Becton Dickinson) or Beckman Coulter MoFlo XDP sorter (Miami, FL). Cells were collected and DNA was prepared for PCR amplification. Single-cell suspensions prepared from various lymphoid organs were characterized with the following mAbs: IgG1-FITC, B220-PE, B220-allophycocyanin, CD4-PE, CD8-CyChrome, CD3-FITC (BD Biosciences), and PNA-FITC (Vector Laboratories). All analyses were performed with a FACSCalibur (BD Biosciences), and results were analyzed with CellQuest or FlowJo software. The immunization protocol was described previously (39). Briefly, SRBCs were injected i.p. into mice on days 0 and 5, and spleens and mesenteric lymph nodes were harvested 10 d after immunization. For c-myc locus mutation analysis, DNA was extracted from sorted GC B cells (B220+PNAhigh) or naive B cells (B220+PNAlow) as described above or from the tail as a control for germline sequence. iProof high-fidelity DNA polymerase (Bio-Rad, Hercules, CA) was used to amplify the first intron region of the wt c-myc or c-mycSγ2b allele, PCR products were subsequently cloned into the p-GEM easy vector (Promega), and miniprep clones were sequenced. Sequences were analyzed with DNASTAR/SeqMan software and were aligned with the corresponding genomic sequences of c-myc (accession no. AC134611) or Sγ2b (accession no. AJ851868, http://www.ncbi.nlm.nih.gov/nuccore/126349412). Primers for wt c-myc allele were forward primer (primer A), 5′-CGGGTCCGACTCGCCTCACT-3′, reverse primer (primer B), 5′-GACACCTCCCTTCTACACTCTAAACCG-3′; primers for the c-mycSγ2b allele (C and D) are described above. A Fisher exact test (2 × 2 table, two-sided) for statistical significance was applied to compare mutation frequency between different regions or loci. RT-PCR was performed as described previously (39). 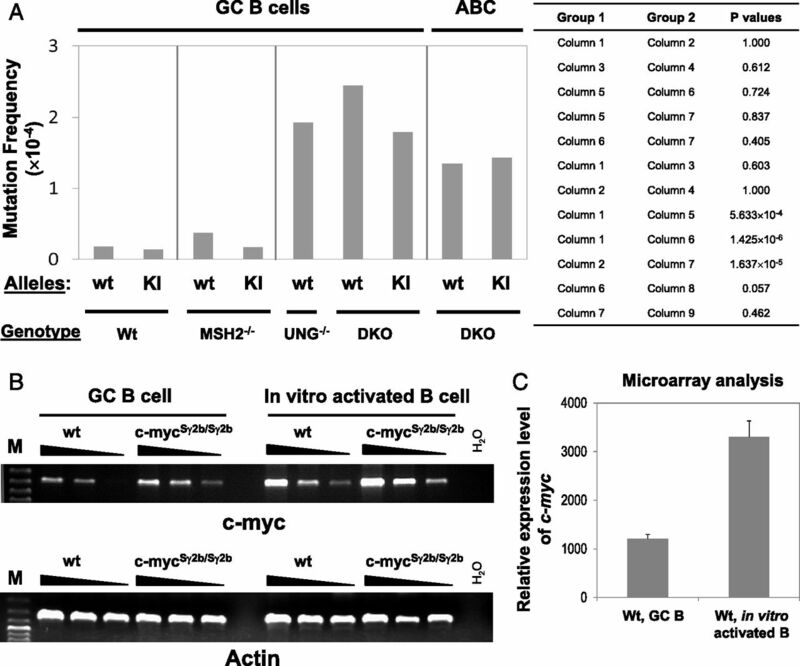 GC B cells were isolated from wt or c-mycSγ2b/Sγ2b homozygous mice. Total RNA was purified with TriPure (Roche) and used for the reverse transcription reaction (Promega). The forward primer for c-myc (in exon 1) was 5′-CGGGTCCGACTCGCCTCACT-3′; the reverse primer for c-myc (in exon 2) was 5′-GCTCTGCTGTTGCTGGTGATAGAA-3′. Actin primers were described previously (39). For PCR conditions, the following applied: first round PCR, 94°C 3 min, 94°C 15 s, 62°C 15 s, 68°C 7 min plus 20 s per cycle, 25 cycles, 68°C 5 min for final extension; second round PCR, 94°C 3 min, 94°C 15 s, 62°C 15 s, 68°C 7 min, 25 cycles, 68°C 5 min for final extension. Retroviral infection was performed as described previously (41). Briefly, Phoenix cells were cultured with DMEM and primary T or B cells were culture with RPMI 1640. All culture media were supplemented with 10% FBS, antibiotics (penicillin/streptomycin, Invitrogen), 10 mM HEPES, nonessential amino acids (Cellgro), sodium pyruvate, and l-glutamine. Empty vector expressing GFP or the vector expressing N-Flag-AID-IRES-GFP (50 μg) were transfected into Phoenix packaging cells via calcium phosphate precipitation. An N terminal Flag tag was added to Aicda cDNA via a PCR approach and the resulting PCR fragments were cloned into the pMX-IRES-GFP vector. Retroviral supernatants were collected at 48 and 72 h after transfection and used for infecting primary T cells. Primary T cells were purified from c-mycSγ2b/ATM−/− mice by enriching CD43+ cells (StemCell Technologies), cultured for 2 d with Con A (1.5 μg/ml), and infected with retroviral supernatant as described previously (41). Two days postinfection, cells were collected and GFP+ cells were sorted for subsequent FISH analysis and Western blot. Anti-AID Ab (39) was used at a dilution of 1:1000 and anti-Flag Ab (Sigma-Aldrich) was used to distinguish the exogenously expressed AID in T cells. It has been proposed that certain non–Ig loci such as c-myc are protected from AID-mediated mutations (31). To investigate the protective mechanism and better define its role in regulating B cell genomic instability during immune responses, we established the c-mycSγ2b KI model. Sγ2b, the S region located upstream of Cγ2b exons, was chosen because previous studies have shown that Sγ2b undergoes internal deletions in random genomic locations in B cell lines (40), suggesting it could be targeted by AID in a position-independent manner. Additionally, our model allows us to test whether an S region can induce specific AID targeting to a locus such as c-myc that normally has little SHM activity (36–38). Using homologous recombination in ES cells, we inserted the genomic fragment of Sγ2b into c-myc intron 1 (Fig. 1), where it was transcribed by the endogenous c-myc promoter. Mice heterozygous for the Sγ2b insertion (c-mycSγ2b/+) were bred to yield homozygous KI mice (c-mycSγ2b/Sγ2b). The latter were viable and fertile and had normal lymphocyte development and CSR in vitro (data not shown). These data indicate that the insertion of the S region did not perturb c-myc functions because c-myc deficiency leads to embryonic lethality (44). Furthermore, the transcript level of the c-myc gene in the homozygous KI B cells appeared to be normal, suggesting that the inserted S region did not significantly affect the overall transcription of the c-myc locus (see below). Generation of the c-mycSγ2b KI model. (A) Gene targeting strategy of an Sγ2b region into the mouse c-myc locus. A restriction endonuclease map of the endogenous c-myc locus is shown. The open box represents the noncoding exon 1 of c-myc (Ex1), and closed box represents the coding of exons 2 and 3 of c-myc (Ex2 and Ex3). A targeting vector containing the 5′ and 3′ homologous arms was used to introduce the Sγ2b region into the first intron of c-myc. Closed triangles represent the loxP sites. (B) Southern blot analysis of wt and c-mycSγ2b KI mouse tail DNA. BamHI and EcoRV double-digested tail DNA was hybridized with probe D as shown in (A). Germline and targeted bands (in kb) are indicated by arrows. 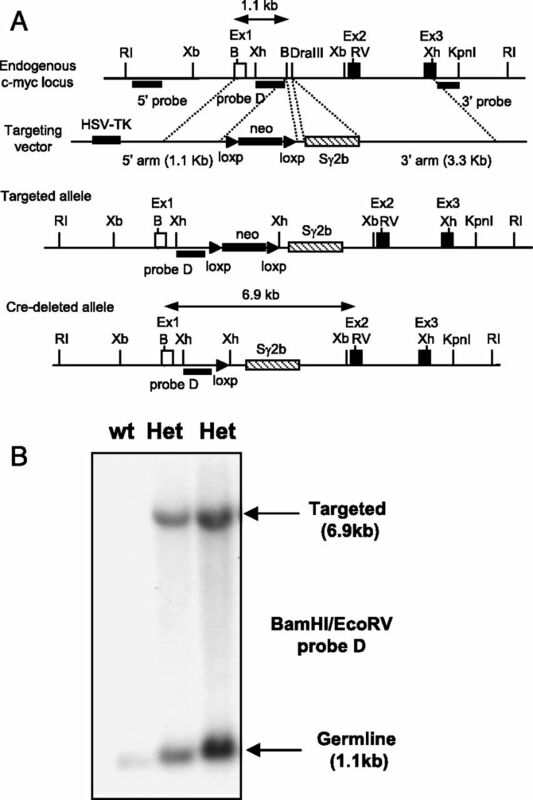 B, BamHI; Het, heterozygous KI mice carrying the inserted Sγ2b region on one allele and endogenous c-myc locus on another; RI, EcoRI; RV, EcoRV; Xb, XbaI; Xh, XhoI. To test whether the c-mycSγ2b allele is an AID target in GC B cells, c-mycSγ2b/+ or c-mycSγ2b/Sγ2b mice were immunized with SRBC Ag. Genomic DNA was purified from the sorted B220+PNAhigh GC or B220+PNAlow naive B cells from the immunized mice. We employed a PCR approach with specific primers designed for the wt versus c-mycSγ2b allele (Supplemental Fig. 1A), and the amplified PCR products were subcloned and sequenced for mutational analysis. The sequenced regions for both alleles were delineated in detail with the AGCT motifs marked (Supplemental Fig. 1B, 1C). The mutation frequency of the wt c-myc allele in the GC population was extremely low and comparable to the background level of mutations detected in the B220+PNAlow population or tail DNA (Table I). Unexpectedly, we found that the inserted Sγ2b region also mutated at an extremely low frequency comparable to that observed in the wt c-myc first intron region (Table I). Moreover, the mutation frequency of the inserted Sγ2b region was similar in the B220+PNAhigh, B220+PNAlow population or tail DNA (Table I). The JH4 intronic region was also sequenced as a positive control, which had a much higher level of mutations than the wt or c-mycSγ2b allele in GC B cells (Table I). Thus, our results demonstrate that the wt c-myc sequence has an extremely low level of mutations in the in vivo Ag-stimulated GC B cells. Surprisingly, the insertion of an S region sequence, a bona fide AID target, did not enhance the mutation frequency of the c-myc locus. Next, we investigated whether the inserted S region influenced the level of genomic instability at the c-myc locus in GC B cells by measuring the frequency of DSBs or translocations. To precisely quantify these abnormalities occurring within the c-myc locus, we employed a two-color FISH assay using two BACs that flank the 5′ or 3′ ends of the c-myc locus, respectively. The B220+PNAhigh GC and B220+PNAlow naive B cells were isolated from the immunized wt, c-mycSγ2b/+, or c-mycSγ2b/Sγ2b mice and cultured in vitro for a short period of time that was required for generating a sufficient amount of metaphases for FISH analysis. The percentage of metaphases was much higher in GC than in naive B cells, consistent with the active phenotypes of GC B cells. Metaphase spreads from the GC and naive B cells of various genotypes were scored for split signals to measure the frequency of c-myc locus abnormalities. We detected only a background level of breaks/translocations at the c-myc locus in Ag-stimulated GC B cells regardless of genotype (Fig. 2A, Supplemental Table I). Additionally, naive B cells also harbored an extremely low level of c-myc genomic instability (Fig. 2A, Supplemental Table I). Thus, we conclude that the inserted Sγ2b region does not lead to a higher level of c-myc locus DSBs or translocations. The inserted S region has no effects on genomic instability of the c-myc locus in primary GC B cells. (A) Quantification of c-myc locus abnormalities in GC B cells of control (n = 3), c-mycSγ2b (n = 3), ATM−/− (n = 3), and c-mycSγ2b/ATM−/− (n = 3) mice and naive B cells of c-mycSγ2b/ATM−/− (n = 2). Data are presented as means ± SEM. (B) Quantification of Igh locus abnormalities in GC B cells of control (n = 3), c-mycSγ2b (n = 3), ATM−/− (n = 3), and c-mycSγ2b/ATM−/− (n = 3) mice and naive B cells of c-mycSγ2b/ATM−/− (n = 2). Data are presented as means ± SEM. Statistical analyses were calculated by a Student t test with two-tailed distribution and equal variance. For comparison among GC B cells, p = 0.039 (control versus c-mycSγ2b), p = 1.806 × 10−5 (control versus ATM−/−), p = 0.0125 (control versus c-mycSγ2b/ATM−/−), and p = 0.51 (ATM−/− versus c-mycSγ2b/ATM−/−). For comparison between GC and naive B cells of ATM−/− and c-mycSγ2b/ATM−/−, p = 0.00536. (C) Diagram of Igh metaphase FISH probes and abnormalities. Metaphase FISH showing intact (colocalization of green and red signals) and broken (split green and red signals) Igh (indicated with white arrow). Metaphases were stained with DAPI. Original magnification ×630. (D) FACS analysis of GC formation. Wild-type, c-mycSγ2b (c-mycSγ2b/+ or c-mycSγ2b/Sγ2b), ATM−/−, and c-mycSγ2b/ATM−/− mice were immunized with SRBC Ags (n = 5/group). Splenic B cells were purified and stained with anti–PNA-FITC and anti–B220-PE Abs. The representative flow cytometry analysis is shown. ATM deficiency causes defective GC formation whereas the insertion of the S region into the c-myc locus does not have an obvious effect on GC reaction. However, it remains possible that the inserted S region might increase the frequency of DSBs that are properly repaired in the presence of a normal DSB response. To test this possibility, we crossed the c-mycSγ2b allele into ATM−/− mice that have an impaired DSB response and assayed for genomic instability of the c-myc locus in the double mutant c-mycSγ2b/ATM−/− GC B cells. However, we still did not detect a significant level of c-myc locus abnormalities in these c-mycSγ2b/ATM−/− GC B cells (Fig. 2A). Consistently, we found that the mutation frequency of the inserted Sγ2b region in the c-mycSγ2b/ATM−/− GC B cells was still extremely low (Table I). Thus, our data definitively demonstrate that the inserted Sγ2b region did not mutate or enhance the genomic instability at the c-myc locus in the in vivo Ag-stimulated GC B cells. It remains possible that GC B cells harboring DSBs might be prone to cell death that leads to the absence of c-myc genomic instability. To exclude this possibility, we assayed for Igh locus abnormalities in GC B cells of various genotypes. We found that both ATM−/− and c-mycSγ2b/ATM−/− GC B cells harbored a similarly high level of Igh locus abnormalities, shown as split signals of Igh probes (Fig. 2B, 2C, Supplemental Table I), whereas the wt control or c-mycSγ2b groups displayed a background level of Igh abnormalities (Fig. 2B, Supplemental Table I). Additionally, metaphase spreads from the naive B cells of ATM−/− and c-mycSγ2b/ATM−/− mice were analyzed as controls, which harbored a lower level of Igh locus abnormalities (Fig. 2B, Supplemental Table I). This low level of Igh locus abnormalities was caused by ATM deficiency and associated with impaired V(D)J recombination in developing B cells, as shown by previous studies (45). Thus, our data showed, to our knowledge for the first time, that the in vivo Ag-stimulated GC B cells indeed displayed a higher level of genomic instability at the Igh locus in the absence of a normal DSB response. Consistent with the defects in DSB repair, both ATM−/− and c-mycSγ2b/ATM−/− mice had an impaired GC reaction with a much lower percentage of B220+PNAhigh population observed (Fig. 2D). Additionally, we found that the GC reactions were quite comparable between wt and c-mycSγ2b/Sγ2b homozygous mice (Fig. 2D). Given that c-myc is required for initiating and maintaining the GC reaction (46), our results show that the insertion of the Sγ2b region into the c-myc locus has no obvious effects on the functionality of c-myc and does not affect GC reactions. Given that B cells activated with different stimuli undergo distinct differentiation pathways with unique signatures of gene expression (15), we hypothesized that the process to generate AID-mediated DSBs might be differentially regulated in distinct B cell populations. To test this hypothesis, we performed FISH analysis to investigate whether the inserted S region affects the frequency of c-myc locus genomic instability in another population of B cells, which we define as the in vitro cytokine-activated B cells. These B cells were purified from unimmunized naive mice and stimulated with anti-CD40/IL-4 in culture for 4 d. We found that cytokine-activated B cells from wt, c-mycSγ2b, or ATM−/− mice had comparably low levels of c-myc locus abnormalities (Fig. 3A, Supplemental Table II). In contrast, cytokine-activated B cells from c-mycSγ2b/ATM−/− mice harbored a significantly higher level of c-myc locus abnormalities (Fig. 3A, Supplemental Table II). Representative examples are shown for such c-myc DSBs/translocations (Fig. 3B). Among the c-myc locus abnormalities observed, >80% were breaks or breaks/translocations, suggesting that they were being induced in a short period of time in the culture (Fig. 3C). Thus, we conclude that the inserted Sγ2b region enhances the genomic instability of the c-myc locus, in the absence of the normal DSB responses mediated by ATM, in cytokine-activated B cells. The insertion of an S region into the c-myc locus results in an enhanced level of c-myc locus abnormalities. (A) Quantification of c-myc locus abnormalities in anti-CD40/IL-4–activated splenic B cells of wt control (n = 6), c-mycSγ2b (n = 9), ATM−/− (n = 5), c-mycSγ2b/ATM−/− (CGA) (n = 10), and c-mycSγ2b/ATM−/−/AID−/− (CGA, AID−/−) (n = 5) mice. Data are presented as means ± SEM. p = 0.505 (wt control versus c-mycSγ2b), p = 0.449 (wt control versus ATM−/−), p = 2.032 × 10−9 (wt control versus c-mycSγ2b/ATM−/−), p = 0.058 (wt control versus c-mycSγ2b/ATM−/−/AID−/−). Statistical analyses were calculated by a Student t test with two-tailed distribution and equal variance. (B) Examples of c-myc DSBs/translocations. Top, Diagram of c-myc metaphase FISH probes. Bottom, Metaphase FISH showing intact (colocalization of green and red signals) and broken (split green and red signals) c-myc locus (indicated by white arrows). Metaphases were stained with DAPI. Original magnification ×630. (C) Distribution of different types of c-myc abnormalities. The bar graph shows the distribution of the c-myc aberrations found in 4 d anti-CD40/IL-4–activated c-mycSγ2b/ATM−/− splenic B cells categorized as the proportion of metaphases with either breaks alone, breaks plus translocations, or translocations alone. Previous studies showed that Igh–c-myc translocation occurred at a higher frequency in ATM−/−-activated B cells (20) detected via a sensitive PCR approach (47). To further demonstrate that the inserted Sγ2b region increases c-myc locus genomic instability, we successfully employed the PCR approach (Fig. 4A) to assay for the level of Igh–c-myc translocations in the anti-CD40/IL-4–activated B cells of various genotypes. Consistent with previous findings, we found that ATM−/−-activated B cells indeed harbored a higher level of Igh–c-myc translocation (Fig. 4B, 4C). PCR revealed an ∼3- to 4-fold increase in Igh–c-myc translocations in anti-CD40/IL-4–activated c-mycSγ2b/ATM−/− B cells compared with ATM−/− B cells (Fig. 4C), demonstrating that insertion of the S region in the c-myc locus enhanced the level of Igh–c-myc translocation. Translocation breakpoints occurred at the inserted S region or endogenous c-myc intronic sequences (data not shown). Therefore, our data convincingly demonstrate that insertion of the S region enhances the level of genomic instability at the c-myc locus in cytokine-activated B cells. 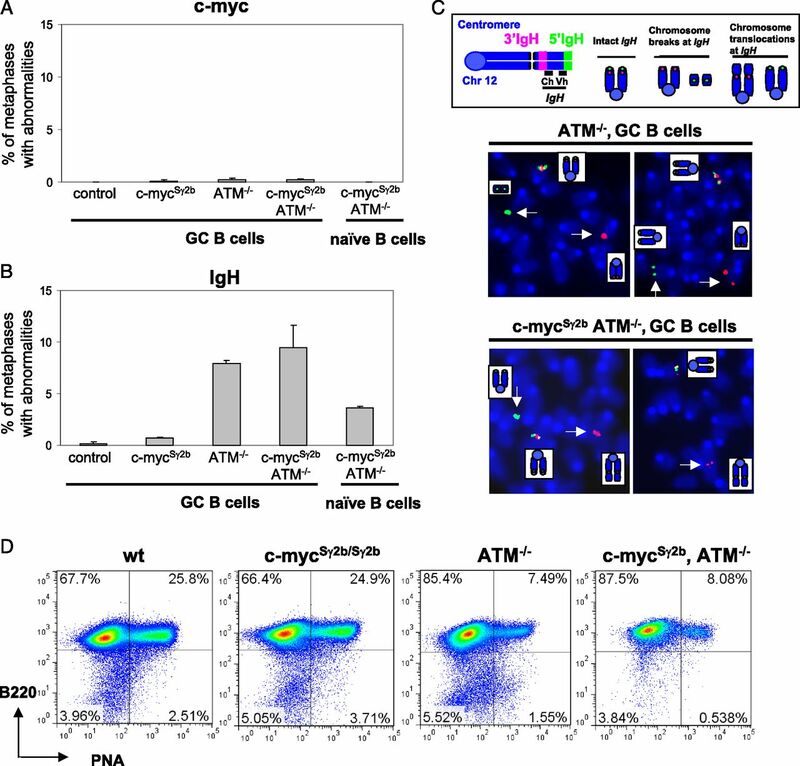 Increased Igh–c-myc translocation frequency in cytokine-activated B cells in c-mycSγ2b/ATM−/− mice. (A) PCR assay to detect Igh–c-myc translocations in day 4 activated splenic B cells. The schematic representation of the PCR assay used for Igh–c-myc translocations is shown. Primers used to detect derivative chromosome 12 (der12) translocations are represented as horizontal black arrows (see details in Materials and Methods). The internal oligonucleotide probe used in Southern blot experiments is shown as a horizontal black bar (T13). Vertical arrows indicate the potential breakpoints in Igh and c-myc loci. (B) Representative Southern blots using the T13 probe are shown for activated wt control, c-mycSγ2b, ATM−/−, and c-mycSγ2b/ATM−/− splenic B cells (day 4 of anti-CD40/IL-4–treated). In each PCR reaction, DNA from either 100,000 or 50,000 cells was used (see details in Materials and Methods). (C) Frequency of Igh–c-myc translocations from day 4 anti-CD40/IL-4–activated splenic B cells. Three independent experiments were performed. Data are presented as means ± SEM. Statistical analyses were calculated by a Student t test with two-tailed distribution and equal variance. p = 0.808 (control versus c-mycSγ2b), p = 0.0493 (control versus ATM−/−), p = 0.0015 (control versus c-mycSγ2b/ATM−/−), p = 0.0029 (ATM−/− versus c-mycSγ2b/ATM−/−). We predicted that the S region–mediated c-myc locus abnormalities in activated c-mycSγ2b/ATM−/− B cells were AID-dependent. To test our hypothesis, we employed two approaches. First, we tested whether AID expression was sufficient to induce c-myc locus abnormalities by ectopically expressing AID in primary T cells. Splenic T cells were isolated from naive c-mycSγ2b/ATM−/− mice, activated, and infected with retroviruses expressing N-terminal Flag-tagged AID and EGFP simultaneously via IRES, or empty vector as a negative control. GFP+ T cells were sorted and employed for Western blotting to confirm the exogenous expression of Flag-tagged AID, using anti-CD40/IL-4–activated B cells as positive controls (Fig. 5A). FISH analysis showed that ectopically expressed AID led to a higher level of c-myc locus genomic instability in the activated c-mycSγ2b/ATM−/− T cells than in control vector–infected T cells (Fig. 5B, Supplemental Table III). Additionally, we assayed noninfected T cells or activated B cells from the same mice for c-myc locus abnormalities and found that the former had an extremely low level of c-myc locus abnormalities whereas the latter displayed a similar level of c-myc locus abnormalities to the other B cell samples analyzed (Fig. 3A, Supplemental Table III). Thus, our data demonstrate that AID is capable of inducing DSBs/translocations in non–B cells. Enhanced c-myc locus genomic instability is AID-dependent. (A) Western blot analysis for AID expression. c-mycSγ2b/ATM−/− splenic T cells were infected with retrovirus expressing N-terminal Flag-tagged AID (N-Flag-AID) or an empty vector as a control. Noninfected T or B cells were employed as negative or positive controls, respectively. 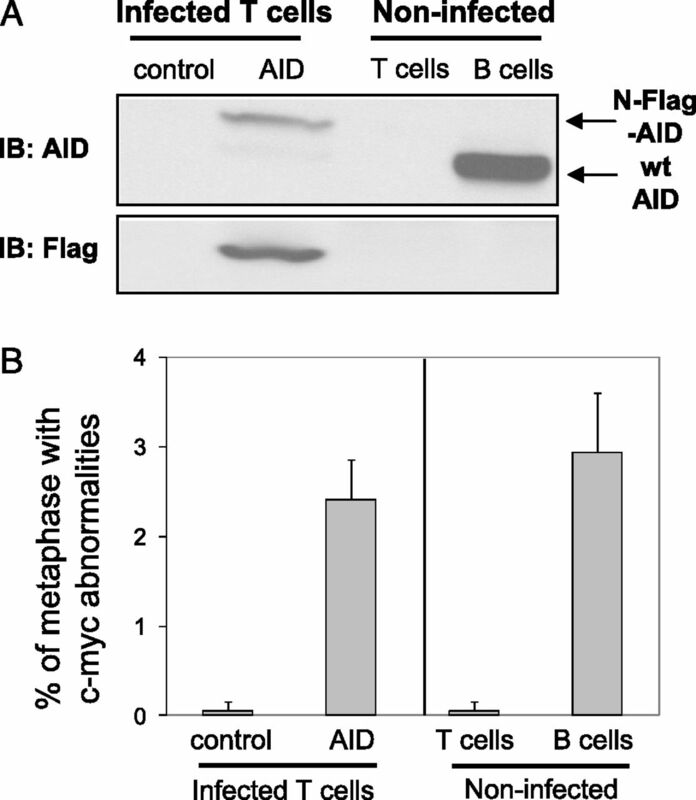 An anti-AID Ab was used to detect the ectopically expressed N-Flag-AID in T cells or endogenously expressed AID in B cells. An anti-Flag Ab was used to detect the ectopically expressed N-Flag-AID. (B) Quantification of c-myc locus abnormalities by metaphase FISH. Control vector or N-Flag-AID–infected c-mycSγ2b/ATM−/− T cells (n = 3) were analyzed for c-myc locus abnormalites. Noninfected T cells (n = 3) or B cells (n = 4) from c-mycSγ2b/ATM−/− mice were used as positive or negative controls, respectively. Data are presented as means ± SD. Statistical analyses were calculated by a Student t test with two-tailed distribution and equal variance. p = 7.77 × 10−4 (control versus AID-infected T cells), p = 7.46 × 10−4 (noninfected T cells versus B cells), p = 0.292 (T cells infected with AID versus B cells). Second, we tested whether AID was required for the S region–mediated c-myc locus abnormalities. We crossed AID deficiency (1) into c-mycSγ2b/ATM−/− mice and assayed for the level of c-myc locus genomic instability in the triple mutant B cells activated with anti-CD40 and IL-4. Our data clearly showed that the increased c-myc locus abnormalities in c-mycSγ2b/ATM−/− B cells were dependent on AID expression, because AID deficiency abrogated the formation of these DSBs/translocations (Fig. 3A, Supplemental Table II). Thus, we conclude that the increased c-myc genomic instability is both AID- and S region–dependent. The generation of DSBs requires AID deamination and recognition of AID-initiated lesions via MMR or UNG. Because our data clearly show that the inserted S region enhances the level of c-myc DSBs/translocations in the cytokine-activated B cells but not in GC B cells (Figs. 2, 3), we first tested whether this difference was caused by differential AID targeting efficiency to the inserted S region in the two populations. To directly compare the frequency of AID deamination and exclude the effects of downstream repair, we introduced the c-mycSγ2b allele into MSH2−/−UNG−/− (27) mice (termed c-mycSγ2b/+/double knockout [DKO]). In the absence of MSH2 and UNG, AID-initiated deamination events are converted to either C→T or G→A mutations by replication machinery (27, 29); thus, these mutations represent the footprint of AID deamination. The compound mutant c-mycSγ2b/+/DKO mice were immunized with SRBC Ag and GC B cells were isolated for mutational analysis. Additionally, splenic B cells were isolated from naive c-mycSγ2b/+/DKO mice, activated by anti–CD40/IL-4 for 4 d and harvested for mutational analysis. We analyzed the c-mycSγ2b KI allele in the MSH2−/−UNG−/− GC versus cytokine-activated B cells and found that the mutation frequency of the KI allele was quite comparable between the two populations (Fig. 6A, column 7 versus 9, Tables II, III). Thus, these data show that the c-mycSγ2b KI allele is targeted by AID in GC and cytokine-activated B cells at a similar frequency. We conclude that a differential AID targeting probably does not contribute significantly to the S region–mediated genomic instability at the c-myc locus. Similar AID deamination frequency and differential c-myc transcription between GC and in vitro cytokine-activated B cells. (A) Mutation frequency of wt and c-mycSγ2b alleles was examined in the GC B cells of wt (n = 9 mice for wt allele; n = 11 mice for c-mycSγ2b allele), MSH2−/− (n = 4 mice for both alleles), UNG−/− (n = 3 mice for wt allele), or MSH2−/−UNG−/− (n = 5 mice for both alleles) immunized mice. Mutation frequency of wt and c-mycSγ2b alleles (n = 3 for both alleles) was examined in cytokine-activated B cells (ABC) isolated from naive MSH2−/−UNG−/− mice. Statistical significance was evaluated by a Fisher exact test (two-sided) for indicated sets of data. (B) A much higher level of c-myc transcripts in cytokine-activated B cells than GC B cells. Semiquantitative RT-PCR analysis for GC and cytokine-activated (anti–CD40/IL-4) B cells isolated from wt or c-mycSγ2b/Sγ2b homozygous mice (n = 3/genotype). cDNA samples were diluted in 1:3 serials. Representative data from one experiment are shown. (C) Microarray analysis of wt GC (n = 4) and cytokine-activated B cells (n = 3) shows a much higher level of c-myc transcripts in the latter population. Consistent with previous studies (31), we found that the mutation frequency of the wt c-myc first intron region was much higher in MSH2−/−UNG−/− or UNG−/− GC B cells compared with wt controls (Fig. 6A, column 1 versus 5 and 6; Tables I, II). In contrast, both wt and c-mycSγ2b KI alleles harbor a very low level of mutations in the GC B cells of c-mycSγ2b/+/MSH2−/− mice (Fig. 6A, columns 3 and 4; Table II). Similar to what we observed for the wt c-myc intron region, the mutation frequency of the inserted Sγ2b region was also much higher in c-mycSγ2b/+/DKO GC B cells (∼10-fold) than in c-mycSγ2b GC B cells (Fig. 6A, column 2 versus 7; Table I, II). Furthermore, we found that both wt and c-mycSγ2b KI alleles mutated at a similar frequency in the GC B cells of c-mycSγ2b/+/DKO mice (Fig. 6A, column 6 versus 7; Table II). Taken together, our data show that the AID-induced DNA lesions are normally repaired in an error-free manner at the c-myc locus in GC B cells, which are only detectable in the absence of MSH2 and UNG; moreover, target DNA sequences have a minimal effect on the processing manner of such DNA lesions. Previous studies clearly showed that transcription is required for SHM (38, 48, 49). However, it remains unclear whether the level of transcription correlates with AID targeting efficiency. Because we detected no difference in AID deamination among different populations, we next examined the transcript levels of c-myc in GC or cytokine-activated B cells from wt or c-mycSγ2b/Sγ2b homozygous mice that harbor the inserted S regions at the c-myc locus for both alleles. Our semiquantitative RT-PCR analysis showed that GC B cells expressed a much lower level of c-myc transcripts than do cytokine-activated B cells, regardless of genotypes (Fig. 6B). Consistently, the level of c-myc transcripts was ∼2.7-fold less in wt GC B cells than in cytokine-activated B cells as shown by microarray analysis (Fig. 6C). Thus, we conclude that the level of c-myc transcription is lower in GC than cytokine-activated B cells. However, the c-myc transcript level is relatively comparable between wt and c-mycSγ2b/Sγ2b B cells in both GC and cytokine-activated B cells (Fig. 6B). These data suggest that the inserted S region does not significantly affect the overall transcription of the c-myc locus. Taken together, our data indicate that, within a certain range, the difference in transcription levels has no obvious effects on AID targeting efficiency (deamination) whereas it might influence the processing and repairing of such AID-initiated lesions. We employ a genetic approach to address the fundamental aspects of the current models for AID-mediated sequence diversification during B cell activation. We present three unexpected novel findings: 1) there exists a clear difference between GC and in vitro cytokine-activated B cells in the context of AID-associated genomic instability; 2) locus-specific regulatory mechanisms may override the effects of S region sequence motifs in determining AID-mediated mutation frequency; and 3) AID-initiated lesions that occur at a similar frequency can be differentially processed in distinct B cell populations. Using our c-mycSγ2b KI mouse model, we detected a high level of c-myc locus DSBs/translocations in the absence of ATM in the cytokine-activated B cells, which are both AID- and S region–dependent. In striking contrast, we observed no significant level of c-myc genomic instability in the GC B cells. Thus, our findings clearly reveal a difference between the populations of GC and in vitro cytokine-activated B cells in their ability to acquire genomic instability, thereby suggesting that conclusions drawn from studies using one population may not be generalizable to others. Additionally, our data suggest that in vitro activation of B (or T) cells might have different effects from what occurs in vivo in a GC response. Because previous studies in the field often rely on in vitro activation of naive B cells as the model system (41, 50–52), we may need to take into consideration the difference between the two experimental models and techniques when investigating CSR and translocation mechanisms. Based on the previous studies showing the superior ability of S region sequences in attracting AID (5, 29, 39, 40, 53–59), we predicted that the KI Sγ2b sequence might enhance AID targeting to the c-myc locus and lead to a higher level of mutations or genomic instability via disrupting the protective repair mechanism proposed to operate at non–Ig loci such as c-myc (31, 60). Unexpectedly, we found that the presence or absence of an S region at the c-myc locus did not alter the frequency of AID-mediated deamination in either GC or in vitro cytokine-activated B cells, seemingly in contrast to the commonly accepted view that S region sequences affect AID targeting (30). The unexpected results are not in line either with our recent study that demonstrated a critical role of target DNA sequences in enhancing AID’s mutagenic activity at a non–Ig locus, Bcl6 (39). In the previous model, we found that the inserted Sγ1 region mutated at a 10-fold higher frequency than did the intronic sequence of Bcl6 (39). Whereas S region sequences are indeed optimal targets of AID in the context of the Igh locus (18, 30), we propose that the capacity of such sequences to increase the frequency of mutations or DSBs at a given locus is dependent on the “genomic context” of the particular locus. However, genomic context represents a broad concept; to define its specific influence on AID-mediated mutagenesis, we propose that locus-specific cis regulatory elements probably account for the disparity between c-myc and Bcl6 loci in terms of AID targeting. Furthermore, we propose that locus-specific regulatory elements play a more dominant role in determining the frequency of AID-mediated mutations, potentially by permitting or prohibiting the S region–mediated sequence-specific effects. Recent studies have highlighted a critical role of cis regulatory elements in AID targeting to Ig loci (61–66). Notably, SHM in the rearranged VH regions is almost completely abrogated in the GC B cells of mice lacking the entire 30 kb of the Igh 3′ regulatory region (67). Therefore, it is conceivable that the locus-specific cis regulatory elements may account for the different mutation frequency between the Bcl6 and c-myc loci. For instance, the transcription levels of c-myc and Bcl6 might be different in GC B cells (68). Bcl6 is highly transcribed in GC B cells expressing a much higher level of transcript than that of naive B cells (68). In contrast, the transcript level of c-myc in GC B cells is either comparable to or even lower than that of naive B cells (46, 68). Thus, the transcriptional microenvironment of these two loci seems to differ greatly, which may set the predetermined mutational threshold in these two loci. In support of this notion, the Bcl6 locus is a physiological target of AID in wt GC B cells (31, 39, 69) whereas the c-myc locus shows an extremely low level of mutations. Taken together, our unique experimental systems reveal the impact of genomic context versus primary DNA sequences on AID-mediated mutagenesis (Fig. 7). Proposed model for the differential processing of AID-initiated lesions in distinct populations of B cells. When similar primary target sequences (e.g., S regions) are placed in different genomic contexts such as Igh, c-myc, or Bcl6 loci, AID-initiated lesions can lead to distinct outcomes, including point mutations, DSBs, or error-free repair of the lesions. We propose that AID-initiated DNA lesions are differentially processed in a locus-specific and population-dependent manner. Hatched box indicates S regions; light green box indicates exons of c-myc or Bcl6 gene; blue/gray/red box indicates assembled V region exons; arrows indicate promoters; and ovals with different patterns indicate enhancers or long-range cis regulatory elements that influence the transcription level of a given locus. With regard to different S regions, Sγ2b was chosen because previous studies have shown that Sγ2b undergoes internal deletions in random genomic locations in B cell lines (40), suggesting it could be targeted by AID in a position-independent manner. Both mouse Sγ1 and Sγ2b regions carry 49-bp repeats, although the density of such repeats appears to be higher in the Sγ1 region (5). However, the density of AGCT motifs, another evolutionarily conserved motif for AID targeting (5, 70), is comparable between the two inserted S regions (0.043 in Sγ2b versus 0.038 in Sγ1). It remains unknown whether these S regions are inherently different in their ability to attract AID. To test this question, a systematic approach needs to be employed by knocking in these sequences into a locus well targeted by AID, for example, the endogenous V region locus. In such a scenario, all the test sequences would be under the control of the same regulatory elements. Hence, we cannot completely exclude the possibility that the inherent features of Sγ1 and Sγ2b regions may contribute to the differential phenotypes in the two KI models, albeit it is much less likely to have a major effect. We found that the GC B cells and in vitro cytokine-activated B cells behave quite differently in terms of DSB generation. However, we show that there is no difference in AID deamination (Fig. 6A); therefore, we reason that the processing of AID-initiated lesions must be differentially regulated in these two populations, potentially by factors such as target DNA sequences, transcriptional regulation, chromatin architecture, or accessibility of DNA repair factors. AID-initiated U:G mismatches can be recognized by UNG or MSH2/MSH6, leading to qualitatively distinct outcomes. Whereas UNG appears to play a more dominant role in inducing DSBs during CSR, MSH2 is required for inducing A/T mutations during SHM of the V region (2, 23, 25, 27, 28). We propose that differential transcription levels might affect how DNA repair factors access the DNA templates via regulating the formation of a higher order DNA structure in the inserted S region in distinct populations. In this regard, we suggest that S regions may harbor unique features such as repetitive sequence motifs (5) that render them more prone to form DSBs. In line with this notion, we found that the level of c-myc transcripts was significantly higher in the cytokine-activated B cells than in GC B cells. We propose that such a relatively higher level of transcription might support a permissive local microenvironment facilitating S regions to form higher order structures for DSB generation, thereby leading to an enhanced level of c-myc locus genomic instability in the in vitro cytokine-activated B cells. In contrast to the c-myc locus, which exhibits a differential repair in distinct populations, the Igh locus appears to behave differently (Fig. 7), in conjunction with previous analysis (9, 19, 20, 27, 29, 41, 71), and our data show that AID-initiated lesions in the S regions of the Igh locus consistently undergo error-prone repair that leads to a high level of DSBs in both GC and in vitro cytokine-activated B cells. Notably, recent studies showed that AID-induced DSBs accumulate in Sμ regions in the absence of ATM (72). However, ATM deficiency caused the reduction of mutations and DSB formation at the downstream Sγ regions (72). These data suggest that ATM normally enhances the activity of AID at the downstream acceptor Sγ regions, whereas, in the absence of ATM, Sμ DSBs probably accumulate owing to a lack of recombination partners (72). Consistently, our data showed that ATM is required for a normal level of GC responses. 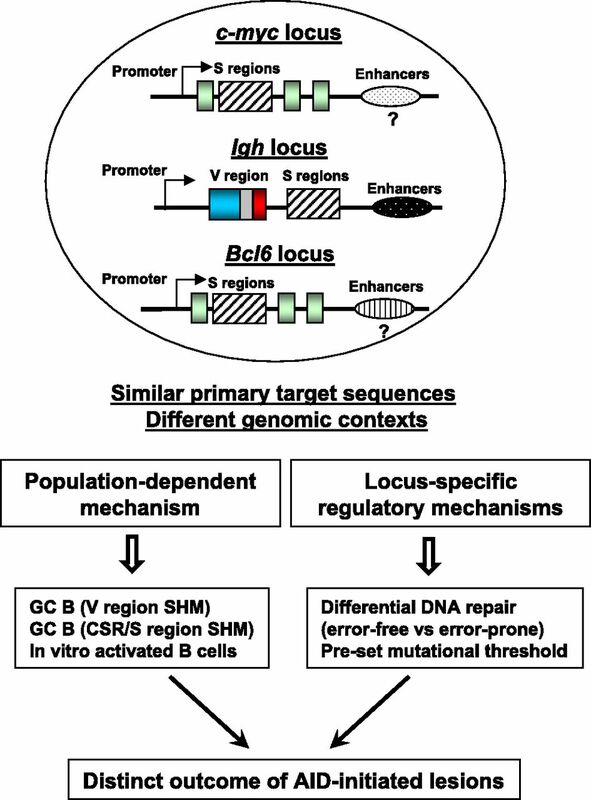 Similar to the Igh locus, certain non–Ig loci such as Bcl6 and Cd83 undergo error-prone repair in GC B cells because the mutation frequency of such loci is comparable between wt and MSH2−/−UNG−/− mice (31). Thus, we propose that locus-specific regulatory mechanisms (e.g., transcription) appear to not only dominate the effects of S region sequences on AID targeting frequency, but they also influence the repair manner of AID-initiated lesions. When isolating GC B cells it is extremely difficult to determine what happens at the time of isolation compared with what happened since the initiation of the GC response. Hence, it is possible that SHM (i.e., V region mutation) and CSR occur sequentially rather than simultaneously; addressing this question will require a better experimental system to track the mutations in V regions versus DSBs in S regions in real time. It is possible that the GC cells isolated in our study mostly undergo “V region SHM,” whereas the in vitro–activated B cells exclusively undergo CSR and “S region SHM.” Although it is impossible to determine the status of individual GC B cells, our data show that, as a pooled population, some fraction of these B cells at least undergo DSB generation at the Igh locus (Fig. 2). Although we cannot pinpoint the exact location of these DSBs within the Igh locus, it is conceivable to suggest that most of them occur during Igh CSR. Thus, it remains equally possible that a small fraction of GC B cells isolated are capable of undergoing CSR and “S region–like SHM.” Indeed, we think that the c-myc gene undergoes such a mutagenic process in GC B cells; however, almost all of these mutations are corrected properly due to error-free repair in this population (Fig. 7). We thank Dr. Frederick W. Alt for generous support of this study, Dr. Janet Stavnezer for MSH2−/−UNG−/− mice, and Dr. Tasuku Honjo for AID−/− mice. We thank Drs. Yu Zhang, Ming Tian, and Feilong Meng for critical reading of the manuscript and thoughtful comments. We apologize to those whose work was not cited due to length restrictions. This work was supported by University of Colorado School of Medicine startup funds, a Boettcher Foundation Webb–Waring Biomedical Research Award, an American Society of Hematology Scholar Award, and National Institutes of Health Grant R01 CA166325-01A1 (to J.H.W.). X.C. is supported by National Institutes of Health Training Grant T32 AI074491 and M.T.E. is supported by National Institutes of Health Grant 3R01CA166325-02S1.
. 2000. Class switch recombination and hypermutation require activation-induced cytidine deaminase (AID), a potential RNA editing enzyme. Cell 102: 553–563.
. 2007. Molecular mechanisms of antibody somatic hypermutation. Annu. Rev. Biochem. 76: 1–22.
. 2007. Evolution of the immunoglobulin heavy chain class switch recombination mechanism. Adv. Immunol. 94: 157–214.
. 2008. Mechanism and regulation of class switch recombination. Annu. Rev. Immunol. 26: 261–292.
. 2009. DNA targets of AID evolutionary link between antibody somatic hypermutation and class switch recombination. Adv. Immunol. 101: 163–189.
. 2012. Classical and alternative end-joining pathways for repair of lymphocyte-specific and general DNA double-strand breaks. Adv. Immunol. 116: 1–49.
. 2010. Alternative end-joining catalyzes robust IgH locus deletions and translocations in the combined absence of ligase 4 and Ku70. Proc. Natl. Acad. Sci. USA 107: 3034–3039.
. 2010. Alternative end-joining catalyzes class switch recombination in the absence of both Ku70 and DNA ligase 4. J. Exp. Med. 207: 417–427.
. 2007. IgH class switching and translocations use a robust non-classical end-joining pathway. Nature 449: 478–482.
. 1999. Development and maturation of secondary lymphoid tissues. Annu. Rev. Immunol. 17: 399–433.
. 2012. Affinity-based selection and the germinal center response. Immunol. Rev. 247: 11–23.
. 2002. Molecular mechanism of class switch recombination: linkage with somatic hypermutation. Annu. Rev. Immunol. 20: 165–196.
. 2003. Extrafollicular antibody responses. Immunol. Rev. 194: 8–18.
. 2002. Mechanism and control of class-switch recombination. Trends Immunol. 23: 31–39.
. 2001. Signatures of the immune response. Immunity 15: 375–385.
. 2013. Mechanisms of programmed DNA lesions and genomic instability in the immune system. Cell 152: 417–429.
. 2010. Origin of chromosomal translocations in lymphoid cancer. Cell 141: 27–38.
. 2014. Generation and repair of AID-initiated DNA lesions in B lymphocytes. Front. Med. 8: 201–216.
. 2006. H2AX prevents DNA breaks from progressing to chromosome breaks and translocations. Mol. Cell 21: 201–214.
. 2006. Role of genomic instability and p53 in AID-induced c-myc-Igh translocations. Nature 440: 105–109.
. 2003. Immunity through DNA deamination. Trends Biochem. Sci. 28: 305–312.
. 2012. AIDing antibody diversity by error-prone mismatch repair. Semin. Immunol. 24: 293–300.
. 2007. Somatic hypermutation: activation-induced deaminase for C/G followed by polymerase eta for A/T. J. Exp. Med. 204: 7–10.
. 2004. A role for Msh6 but not Msh3 in somatic hypermutation and class switch recombination. J. Exp. Med. 200: 61–68.
. 1998. Hot spot focusing of somatic hypermutation in MSH2-deficient mice suggests two stages of mutational targeting. Immunity 9: 135–141.
. 2006. Somatic hypermutation and class switch recombination in Msh6−/−Ung−/− double-knockout mice. J. Immunol. 177: 5386–5392.
. 2004. Mismatch recognition and uracil excision provide complementary paths to both Ig switching and the A/T-focused phase of somatic mutation. Mol. Cell 16: 163–171.
. 2002. Immunoglobulin isotype switching is inhibited and somatic hypermutation perturbed in UNG-deficient mice. Curr. Biol. 12: 1748–1755.
. 2006. The in vivo pattern of AID targeting to immunoglobulin switch regions deduced from mutation spectra in msh2−/−ung−/− mice. J. Exp. Med. 203: 2085–2094. 2013. The role of activation-induced deaminase in antibody diversification and genomic instability. Immunol. Res. 55: 287–297.
. 2008. Two levels of protection for the B cell genome during somatic hypermutation. Nature 451: 841–845.
. 2001. Mechanisms of chromosomal translocations in B cell lymphomas. Oncogene 20: 5580–5594.
. 1982. Human c-myc onc gene is located on the region of chromosome 8 that is translocated in Burkitt lymphoma cells. Proc. Natl. Acad. Sci. USA 79: 7824–7827. 2012. Mechanisms and impacts of chromosomal translocations in cancers. Front. Med. 6: 263–274. 2005. Mechanisms of B-cell lymphoma pathogenesis. Nat. Rev. Cancer 5: 251–262.
. 2000. The TATA binding protein, c-Myc and survivin genes are not somatically hypermutated, while Ig and BCL6 genes are hypermutated in human memory B cells. Int. Immunol. 12: 1085–1093.
. 1998. Mutation of BCL-6 gene in normal B cells by the process of somatic hypermutation of Ig genes. Science 280: 1750–1752.
. 2001. Somatic hypermutation of immunoglobulin and non-immunoglobulin genes. Philos. Trans. R. Soc. Lond. B Biol. Sci. 356: 13–19.
. 2012. Target DNA sequence directly regulates the frequency of activation-induced deaminase-dependent mutations. J. Immunol. 189: 3970–3982.
. 2002. Internal IgH class switch region deletions are position-independent and enhanced by AID expression. Proc. Natl. Acad. Sci. USA 99: 9984–9989.
. 2009. Mechanisms promoting translocations in editing and switching peripheral B cells. Nature 460: 231–236.
. 2003. E mu/S mu transposition into Myc is sometimes a precursor for T(12;15) translocation in mouse B cells. Oncogene 22: 2842–2850.
. 2008. AID is required for the chromosomal breaks in c-myc that lead to c-myc/IgH translocations. Cell 135: 1028–1038.
. 1993. A null c-myc mutation causes lethality before 10.5 days of gestation in homozygotes and reduced fertility in heterozygous female mice. Genes Dev. 7: 671–682.
. 2007. ATM prevents the persistence and propagation of chromosome breaks in lymphocytes. Cell 130: 63–75.
. 2012. The cell-cycle regulator c-Myc is essential for the formation and maintenance of germinal centers. Nat. Immunol. 13: 1092–1100. 2006. Myc translocations in B cell and plasma cell neoplasms. DNA Repair (Amst.) 5: 1213–1224.
. 1998. Somatic hypermutation in the heavy chain locus correlates with transcription. Immunity 9: 105–114.
. 1998. Cis-acting sequences that affect somatic hypermutation of Ig genes. Immunol. Rev. 162: 153–160.
. 2011. Genome-wide translocation sequencing reveals mechanisms of chromosome breaks and rearrangements in B cells. Cell 147: 107–119.
. 2011. Translocation-capture sequencing reveals the extent and nature of chromosomal rearrangements in B lymphocytes. Cell 147: 95–106.
. 2011. Deep-sequencing identification of the genomic targets of the cytidine deaminase AID and its cofactor RPA in B lymphocytes. Nat. Immunol. 12: 62–69.
. 2009. Immunoglobulin switch mu sequence causes RNA polymerase II accumulation and reduces dA hypermutation. J. Exp. Med. 206: 1237–1244.
. 2011. AID recruits UNG and Msh2 to Ig switch regions dependent upon the AID C terminus [corrected]. J. Immunol. 187: 2464–2475.
. 2005. Inducible DNA breaks in Ig S regions are dependent on AID and UNG. J. Exp. Med. 202: 561–568.
. 2000. Transcription-induced cleavage of immunoglobulin switch regions by nucleotide excision repair nucleases in vitro. J. Biol. Chem. 275: 24163–24172.
. 2009. S region sequence, RNA polymerase II, and histone modifications create chromatin accessibility during class switch recombination. J. Exp. Med. 206: 1817–1830.
. 2012. Immunoglobulin class-switch DNA recombination: induction, targeting and beyond. Nat. Rev. Immunol. 12: 517–531.
. 2005. Influence of switch region length on immunoglobulin class switch recombination. Proc. Natl. Acad. Sci. USA 102: 2466–2470.
. 2009. Balancing AID and DNA repair during somatic hypermutation. Trends Immunol. 30: 173–181.
. 2009. A cis-acting diversification activator both necessary and sufficient for AID-mediated hypermutation. PLoS Genet. 5: e1000332.
. 2012. Identification of core DNA elements that target somatic hypermutation. J. Immunol. 189: 5314–5326.
. 2008. Cutting edge: a cis-acting DNA element targets AID-mediated sequence diversification to the chicken Ig light chain gene locus. J. Immunol. 180: 2019–2023.
. 2011. Targeting of AID-mediated sequence diversification to immunoglobulin genes. Curr. Opin. Immunol. 23: 184–189.
. 2013. A critical context-dependent role for E boxes in the targeting of somatic hypermutation. J. Immunol. 191: 1556–1566.
. 2010. Attracting AID to targets of somatic hypermutation. J. Exp. Med. 207: 405–415.
. 2013. The IgH 3′ regulatory region controls somatic hypermutation in germinal center B cells. J. Exp. Med. 29: 1501–1507.
. 2003. Transcriptional analysis of the B cell germinal center reaction. Proc. Natl. Acad. Sci. USA 100: 2639–2644.
. 2006. Negative regulation of activation-induced cytidine deaminase in B cells. Proc. Natl. Acad. Sci. USA 103: 2752–2757.
. 2004. An evolutionarily conserved target motif for immunoglobulin class-switch recombination. Nat. Immunol. 5: 1275–1281.
. 2002. Activation-induced deaminase (AID)-directed hypermutation in the immunoglobulin Sμ region: implication of AID involvement in a common step of class switch recombination and somatic hypermutation. J. Exp. Med. 195: 529–534.
. 2014. 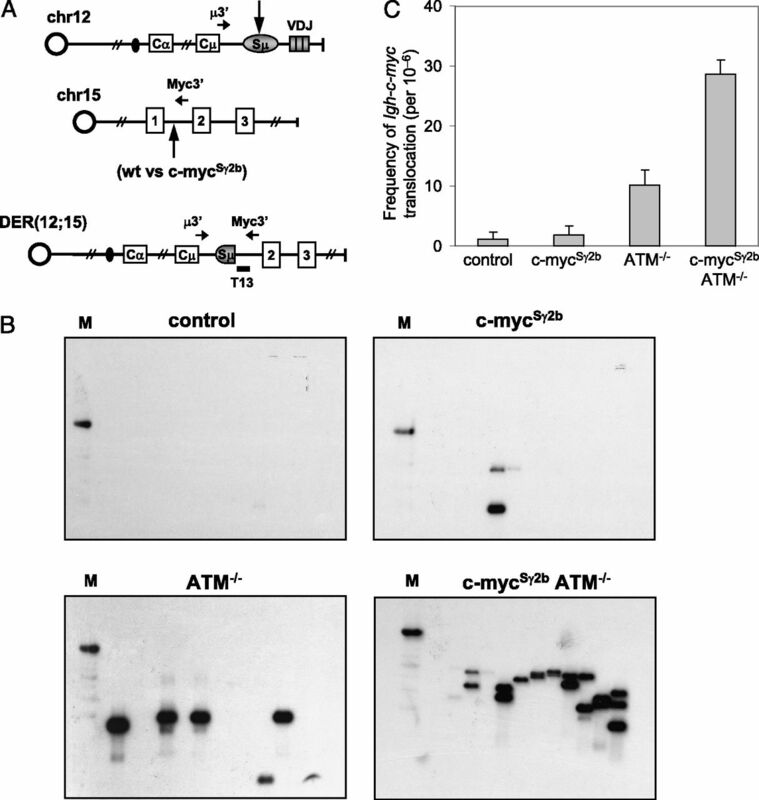 ATM increases activation-induced cytidine deaminase activity at downstream S regions during class-switch recombination. J. Immunol. 192: 4887–4896.
. 2003. H2AX is required for recombination between immunoglobulin switch regions but not for intra-switch region recombination or somatic hypermutation. J. Exp. Med. 197: 1767–1778.
. 2000. Activation-induced cytidine deaminase (AID) deficiency causes the autosomal recessive form of the hyper-IgM syndrome (HIGM2). Cell 102: 565–575.